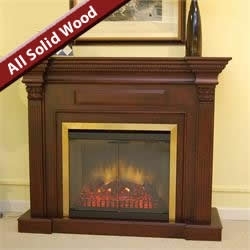 Classically styled and constructed completely from the finest quality kiln dried solid wood. The finish is applied by hand and has the patina reminiscent of the highest quality hand made furniture. A shaped mantel supported by Corinthian capitols featuring carved acanthus leaf design and volutes, create a versatile piece of furniture which compliments all decors from contemporary to classical elegance. Available in dark walnut and antique white.